“Oh my God, just look at that!” I exclaimed out loud just as we approached the little cottage where we were meant to stay for 3-nights in Jasper, Alberta. We were tired, hungry and exhausted after our 13 hour road journey from Vancouver to Jasper, but one look at the beautiful cottage and all our fatigue slipped away replaced with excitement and anticipation. In fact the entire grounds of the hotel were Looking around we saw many more such cottages neatly placed in the greens. They reminded me of the witch’s cottage in the fairy tale ‘Hansel and Gretel’ where the house is made of ginger bread, the roof of chocolate icing and the walls of candy! I sent a silent vote of thanks to our Uncle M who lives in Canada and had strongly recommended this place and had also helped us book it. 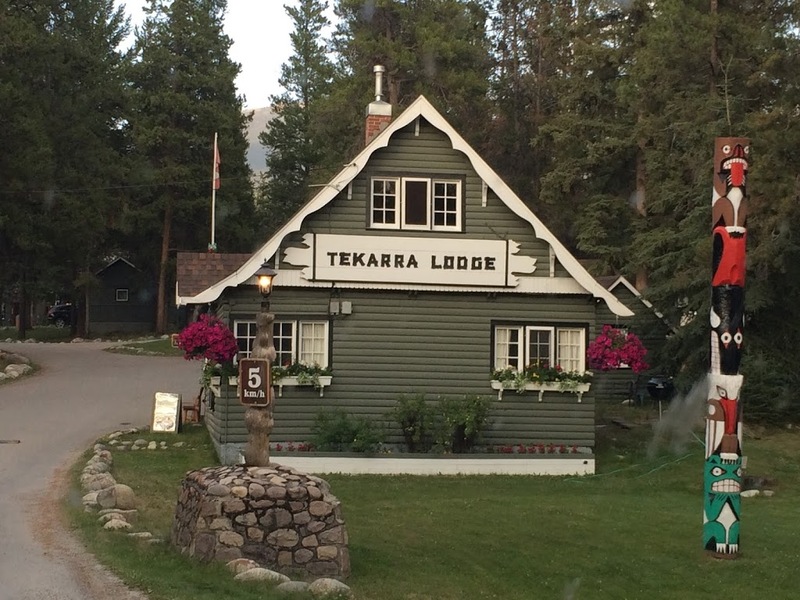 Tekkara Lodge, as it is called is situated pretty close to the Main Street in this magical town of Jasper, surrounded by majestic mountains and mystical woods with picturesque lakes. 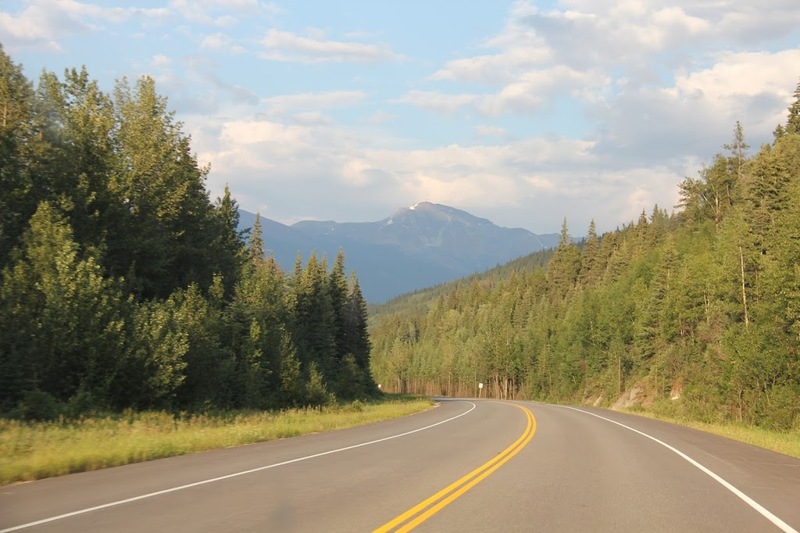 Jasper was the first destination on our road trip through the Rocky Mountains in Canada. Now I have done a few road trips in the past – mostly in England and also in Scotland and Wales, but my very first road trip was the one to Kashmir in North India, 34 years ago, when I was only 6! I don’t know why but it’s this particular road trip that kept occupying my mind the whole time and I couldn’t help comparing it to this one. 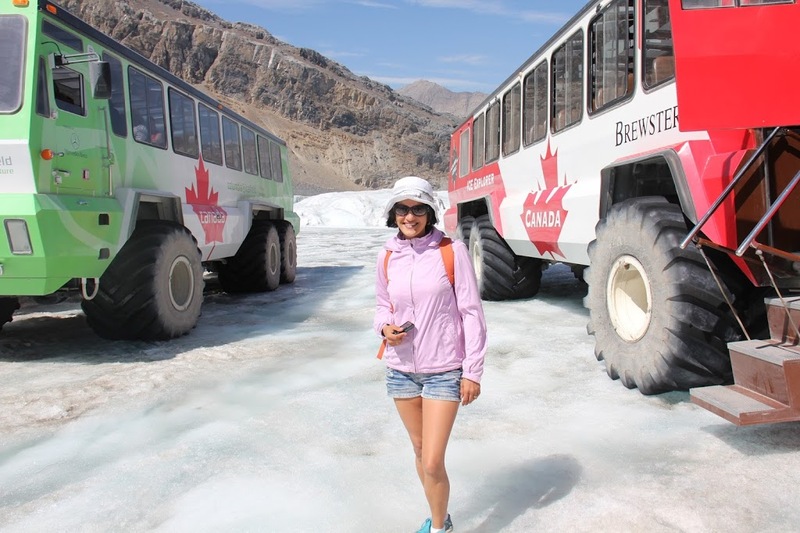 Our Canada road trip had all the planned benefits of tried and tested ‘things to do’, ‘places to visit’, ‘restaurants to eat,’ had the comfort of staying with family and friends, hotels with good reviews, list of dos and don’ts and a planned itinerary. The road trip to Kashmir was as unplanned as a piece of blank paper, which we kept writing on as we did our journey. There were no reviews read, roads mapped or friends and family waiting at the other end. There was no connectivity while we were on the move either, no mobile networks, no GPS guiding us. It was all based on paper maps, basic instincts and the local people guiding us. It was a journey that had to be completed from one sleepy town to the other, enduring hunger pangs when the distances became too long or sleeping in the car when no hotel was in sight. Pot-holed roads, tyre punctures, mosquito filled motel rooms, wrong routes taken, getting stranded without fuel were just some of the challenges faced. And while I have great memories of that trip I am not sure if I would enjoy doing a similar one with my kids in this day and age. 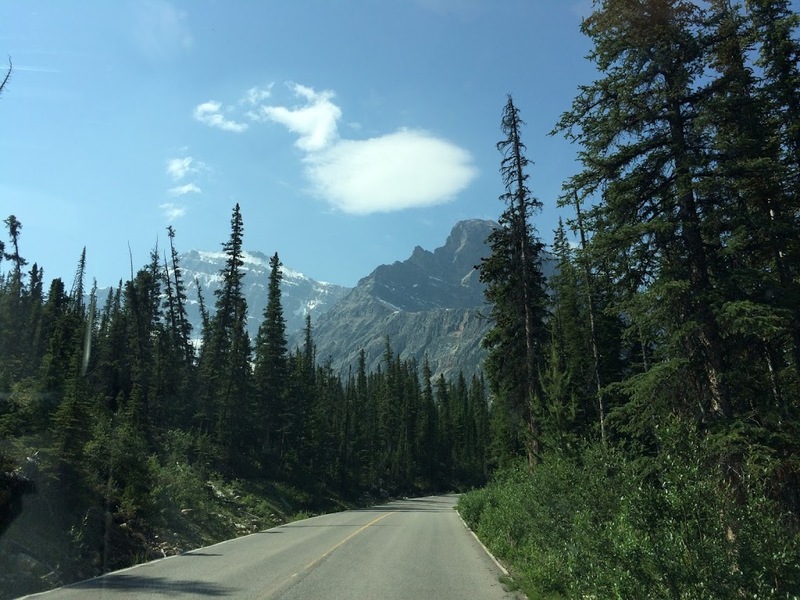 After staying in a dear friend’s beautiful home in Vancouver and taking full advantage of her hospitality that one can only do with a childhood friend, we started our Rockies road trip on Day 3. 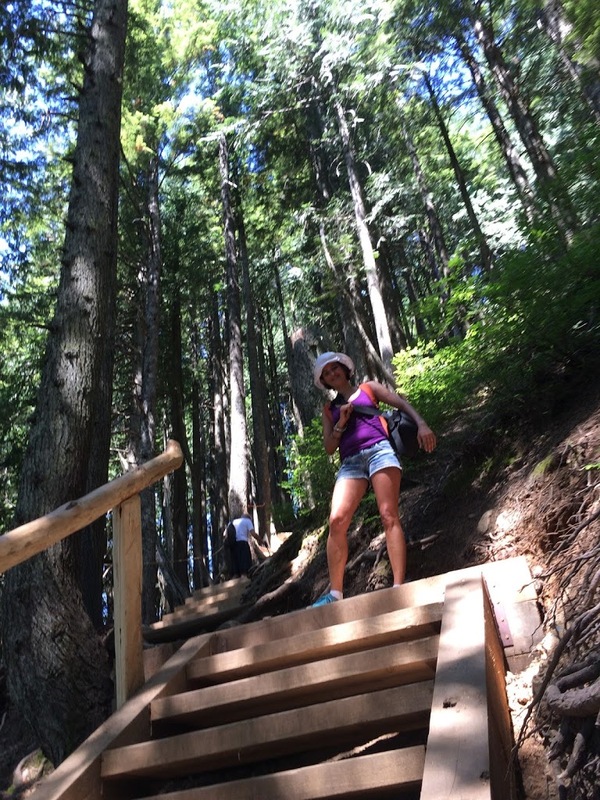 Oh by the way, before I forget, the Grouse Mountain hike is an absolute must in Vancouver. Involving 2830 steps which are more like gravel and earth in most parts, it was sheer enthusiasm of our boys that kept us going /covering each quarter as the 1/4, 1/2, 3/4 signs came up. It is one of my trip highlights. Do read my review on TripAdvisor here. So coming back to Day 3, we made an early start close to 8 o’clock to begin our 775 km journey from Vancouver to Jasper. 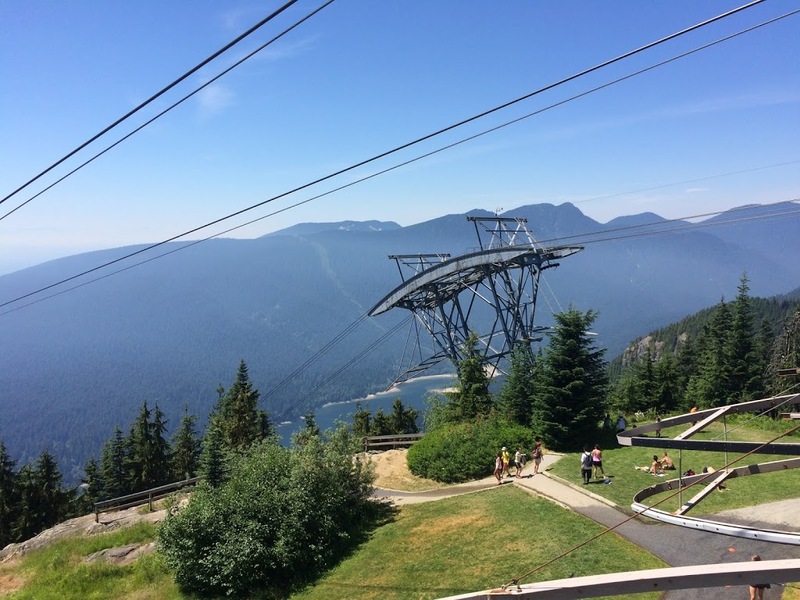 Armed with enough food, water and snacks to feed an army, we drove through the city of Vancouver following the directions given by GPS which as we later realised was taking us on a longer round about journey than through the shortest route! We soon abandoned it and followed the clearly given road signs, reaching a place called Kamloops for lunch where we had a delicious meal at a restaurant called Prime Lounge and Grill. The journey continued with pit stops only to stretch our backs or to take photographs of the beautiful topography as we entered Rocky land! I dozed off quite a few times happy and secure in the knowledge that my husband was a good driver and was enjoyed driving. In fact he did a terrific job all throughout our trip giving me the car only a couple of times when he just couldn’t keep his eyes open. I took on the reins but was a bit shaky as I had never driven a left hand drive car and certainly not a high speed highway. But my husband encouraged me and my younger son agreed to our swap only after confirming that I would be able to drive as fast as Daddy! I soon got the hang of it and cruised down the beautiful roads with a sense of purpose. I can’t remember sleeping so well and till such a late hour as my husband gently woke me up at 9:30 am the next morning. “9:30!” I screeched as I had planned to leave the hotel by 9 to start our extensive sight seeing and activities planned for the day! After all we couldn’t disappoint Uncle M who had planned an extensive itinerary for us giving us all details possible from distances to weather and clothing tips to recommended time of start and finish! As I drew the black out curtains, sunlight streamed in. It was a beautiful day and brought a smile to my lips as I got out of bed. 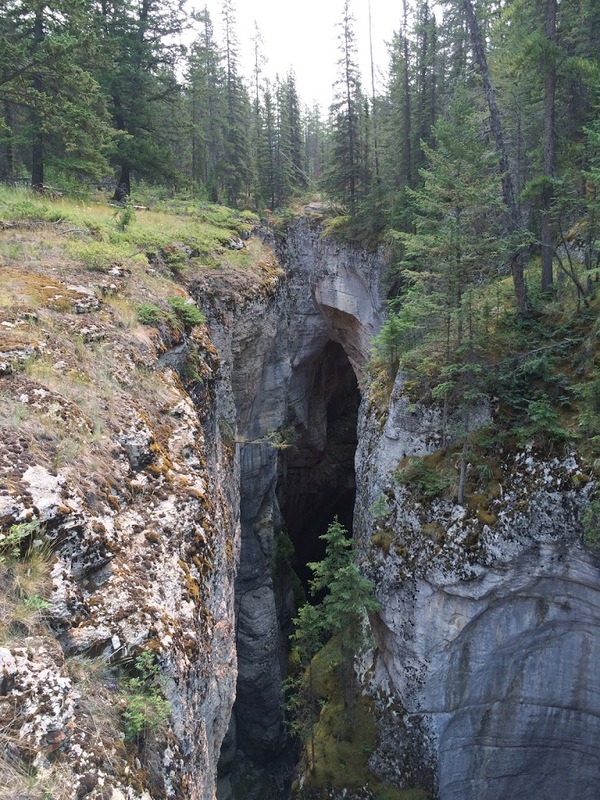 Our first stop was itinerary Maligne Canyon where we did a nice, easy hike taking tons of photographs of the topography and of ourselves too! Tired and hungry we decided to have a leisurely picnic in a scenic spot sitting on a fallen trench of a tree. As I was about to take the first bite of my delicious avocado and cheese sandwich, my elder son jumped up shouting “Ants, ants!” And we realised that we had disturbed a whole colony of angry, red ants who were busy stacking up on their food right underneath our bottoms! We soon abandoned our scenic spot plans and went to the nearby cafe patio to continue our little picnic. We then drove to Medicine Lake where I enjoyed basking in the sun while my husband was busy dipping his feet in the crystal clear water along with the boys. 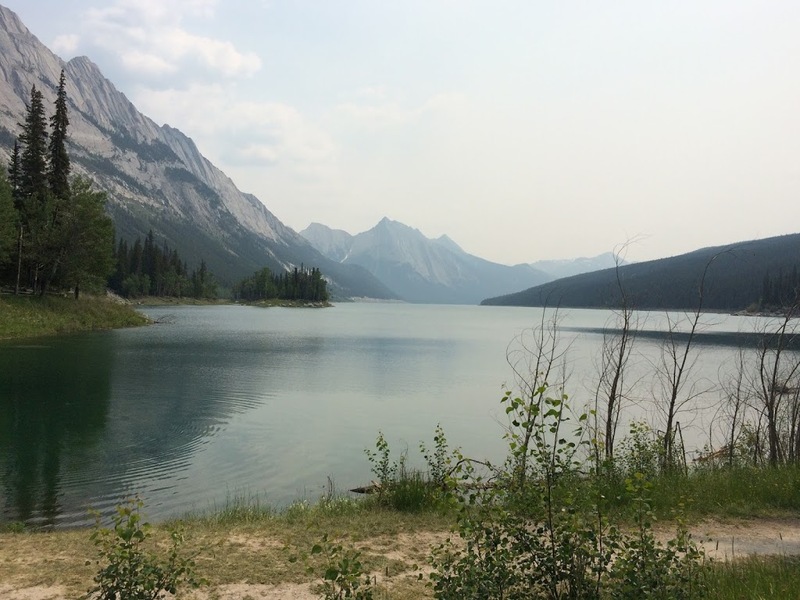 This is beautiful lake and a must-see for anyone visiting Jasper. Our next stop was Malign lake where we stopped for some quick souvenir shopping. 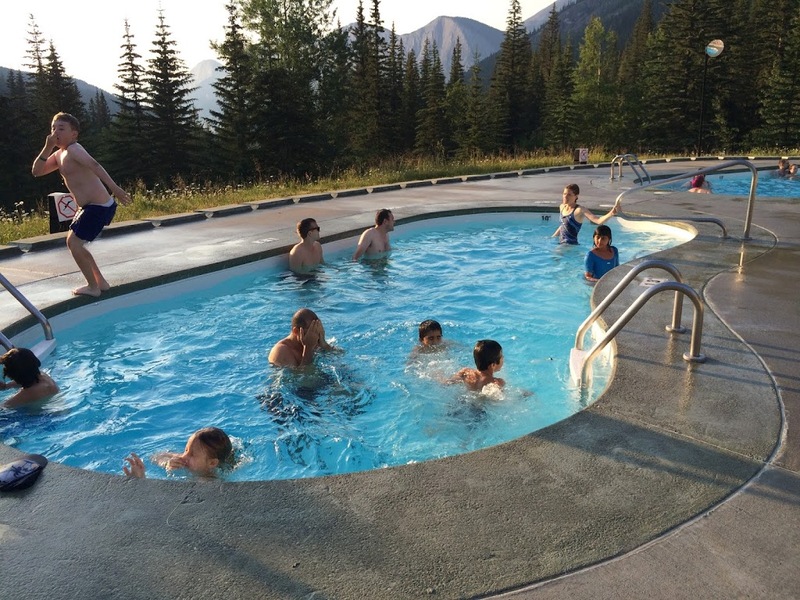 We had to hurry back to town as our itinerary mentioned a place called Miette Hot Springs which was a bit further away and it was already late evening. The good part about visiting Canada in summer is the extended daylight that it offers. It was 7 pm but looked and felt like midday! we had to go up a long, windy road to reach the springs which happened to be temporarily shut due to rain. However our efforts were not in vain as they opened up after 20 minutes and I am so glad I waited. There were four different man made pools holding different temperatures of natural spring water, ranging from 20 to 40 degree Celcius. At first I did not even bother to try out the cold ones as I stepped into the nice warm water and relaxed. However I got a feeling that the people in the colder pools looked happier, so at the insistence of my husband and children I stepped into the coldest pool rather tentatively and it took my breath away! I continued going in, one toe at a time and finally immersed myself completely. I thought I would run out but I was surprised that I liked it in there! After that I took turns alternating between hot and cold and thoroughly enjoyed myself. Again a trip highlight! 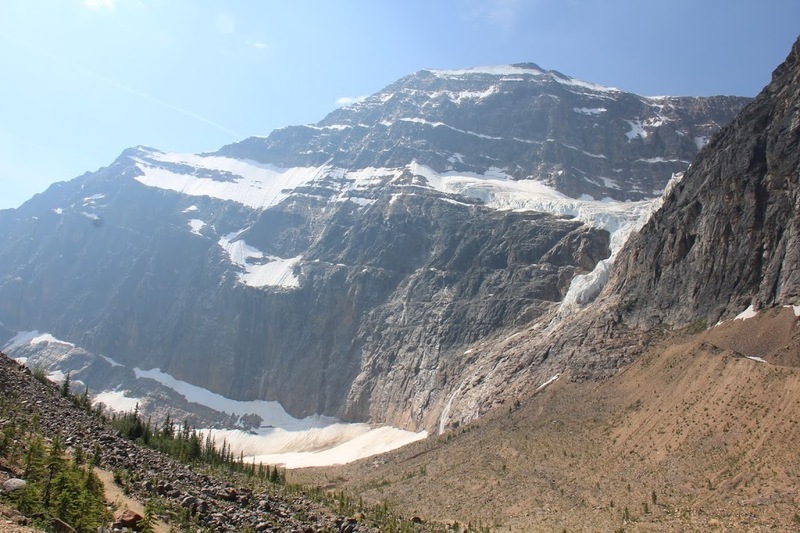 The first half of our next day in Jasper was spent spiraling through the mountains reaching the base of a beautiful glacier on a mountain called Mount Edith Cavell. I love the way each mountain in the Rockies had a name and had a story to tell. This one was named after an English nurse who was executed for helping Belgians and the English to escape during the German occupation in Brussels. Mount Edith being a dominant peak was still covered with snow in an interesting striped pattern during the summer. While the glacier has receded significantly over the years, there is still a significant part left for us to see for another hundred years. The afternoon was even better spent in the middle of an icy cold raging river. With an oar in my hand and the bright hot sun in my eyes, our inflatable boat bounced up and down to the rhythm of the gurgling water and our hands rowed or rested depending on the instructions given by our guide. 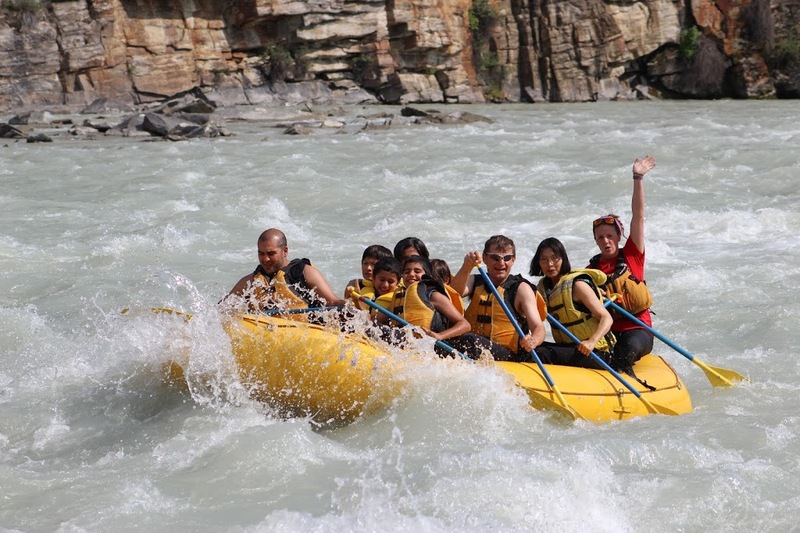 This was my second white water rafting experience and one that I would remember for a long time. The glee on my children’s faces, who were sitting in the first row along with my husband, as the icy cold water splashed on their faces, the rude shock of the same water splashing on me for the first time and the camaraderie shared with the other family in the raft, make us believe in the fact that it’s the simple pleasures in life that give you the most happiness. 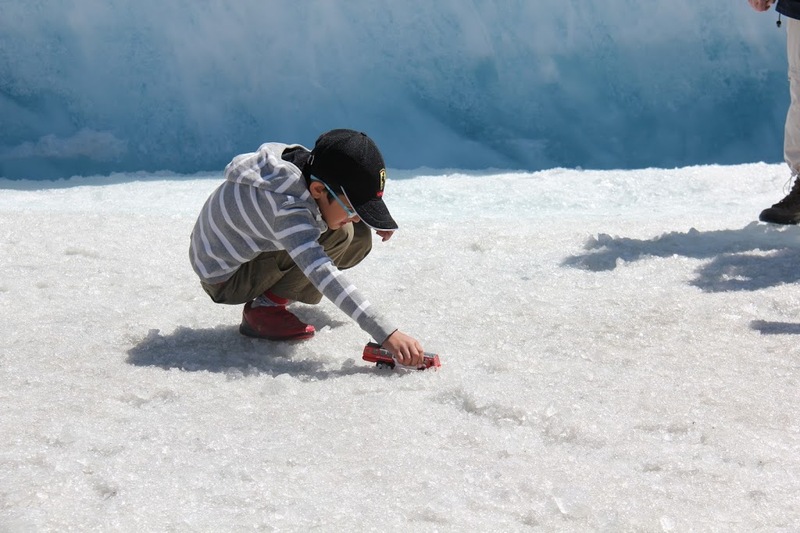 Driving his ice explorer truck on the glacier! Standing tall on 100 m thick ice! Early next morning we reluctantly checked-out of our little haven to head further east towards Lake Louise. 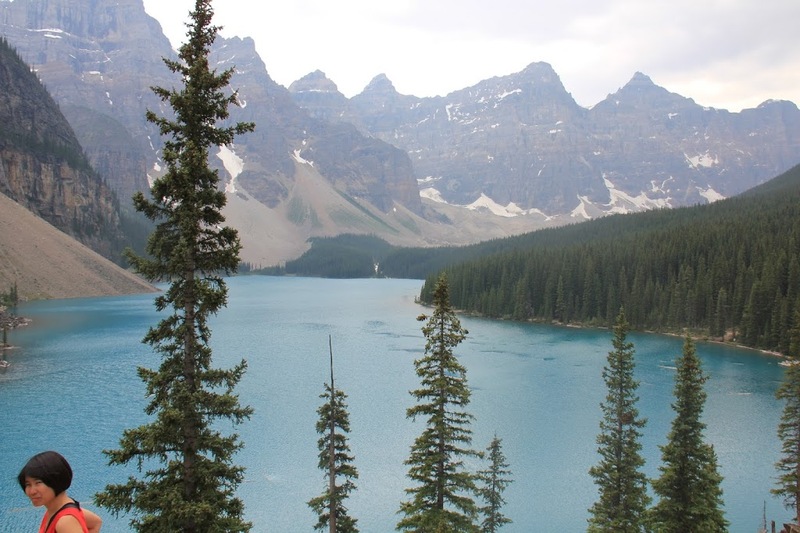 Our tightly packed itinerary had Canada’s favourite tourist spot to be seen en route. 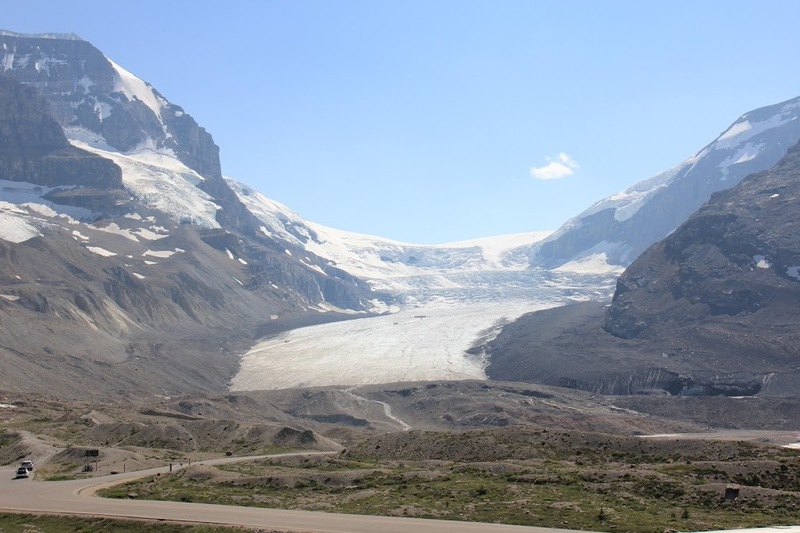 Columbia Ice Fields Glacier Adventure is a big tourist attraction and we were advised to go there early as parking gets difficult. We got lucky and found a decent spot at midday when we arrived. We bought the combo ticket for Skywalk and the Glacier Adventure. Skywalk which is a cliff edge walkway platform wasn’t as ‘adrenaline feeding’ as marketed, instead I really liked the taped recording on the radios offered that took one through each history of Rockies, it’s fauna and flora and gave other interesting details as one walked down the path. The glacier itself was a completely different experience. The boys were super excited to try it out, my younger one specially having bought a toy Ice Explorer truck that was meant to take us on the ice. On our way there we had a friendly guide who gave some interesting and funny facts about the local area. Apparently there are only 23 such trucks in the world, 22 with them and 1 truck in Antartica used by the scientists. We went down a steep incline before we landed on the ice where we were given 20 minutes to walk around and take photographs. The whole experience was surreal and again a must for a tourist. Numbed in body and mind by this event we continued driving. At around 7:00 pm we reached our next destination. The Great Divide Lodge in Yoho National park. We were thoroughly spoilt in terms of accommodation so far and the very ordinary rooms in this very ordinary hotel did not appease us much. Thankfully we just had to spend one night here. One thing I must say that works for the hotel is that it overlooks the beautiful Wapta lake which we used amply as a background for our family photographs the next morning. We then headed to yet another tourist destination called Lake Louise. Tucked into the base of impressive glacier peaks in Banff National Park, the beauty of this lake takes your breath away as you scramble from end to the other trying to decide which is the most beautiful spot to a take a photograph, My suggestion – do not pose in front of it, this lake is to be photographed solo with your camera and memorised with your heart. It was a nice sunny day and we were in the mood of yet another challenging hike. 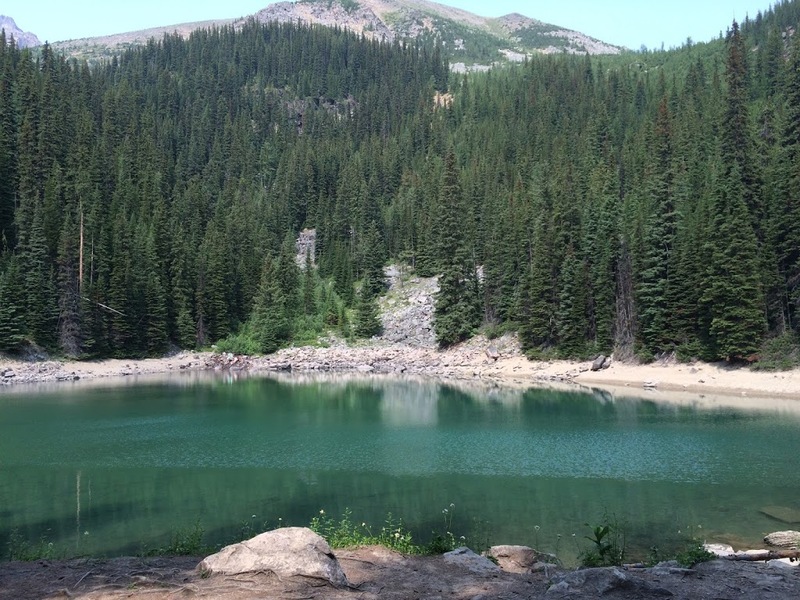 Well challenging for us and ‘moderate’ for proper hikers.There were many different trails to choose from and we chose the Lake Agnes teahouse hike which was 6.8 km return. Turned out to be a good decision as it was perfect for our family of four all having a different need. The husband was rewarded with breathtaking views of Lake Agnes at the top and also a waterfall flowing out of the lake. He did not think twice before dunking his sweaty head into the icy cold refreshing water and almost drank it too! My elder son was ecstatic taking pictures of the local fauna and flora with his own camera, my little boy happy just running up the slope and wading in the lake and me of course with the fitness the hike offered not to mention the feeling of being one with the Rockies we had gained quite an elevation. But the best of all was the walk or should I say run down the trail on our way back as we were caught in a sudden downpour! Another trip highlight! What’s a road trip without souvenir shopping so the last one hour was spent buying goodies, a Canada apron, a Lake Louise magnet, traditional Indian art, a maple leaf Christmas ornament and even an antique looking back-scratcher! After a few more hours of driving we ended our road trip at M uncle’s place in Calgary. I felt a tad bit disappointed not beng able to see the majestic Rockies along with us anymore, but any feeling of disappointment was quickly made to vanish with bear hugs, a real home and piping hot home made Parsi food! So what makes a road trip? People? Relationships? A car? A road? Maybe its much more than that. Filled with laughter and tears, music and silence, arguments and agreements, chaos and peace? Lots of photographs, road maps, pit stops and fuel stops. Exhilaration, excitement, fatigue, boredom. Where are we going? What are we looking for? Just enjoy the journey I would say, the destination is bound to come anyway!